Figure 1. Location of the Sandholdt Property adjacent to the Main Building of MLML. The yellow line represents the boundaries of the property. 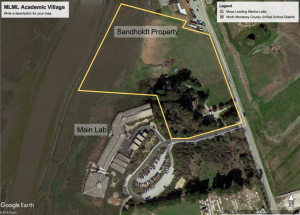 In 2005, MLML and the SJSU Research Foundation purchased 9.2 acres adjacent to the main MLML building (Figs. 1 & 2) with the intent of building an Academic Village. Anyone that has attended MLML realizes that one of the main impediments to student life here is housing. 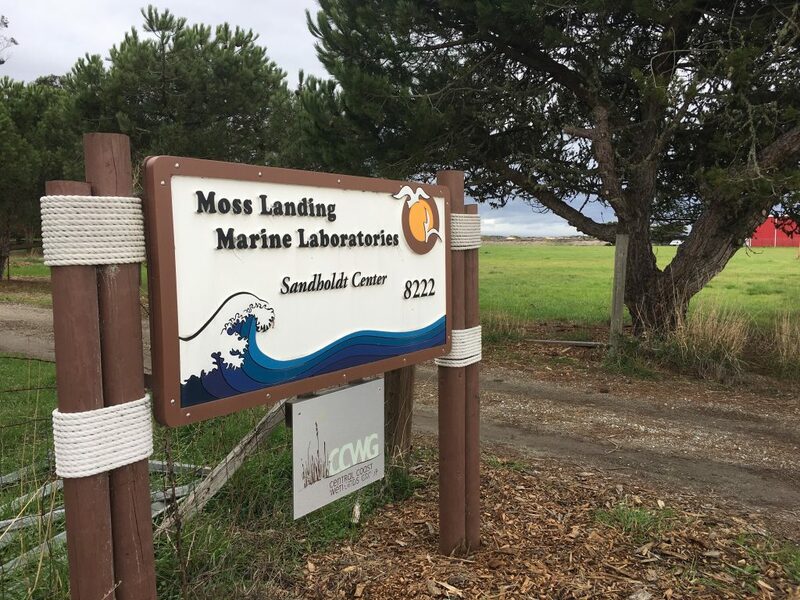 It is a critical need for everyone, but students at MLML are particularly impacted because tuition and living costs have increased dramatically, housing in the area is scarce and expensive, and the cost of conducting field-based research also is increasing. We have always realized we needed housing and other amenities to remain competitive and better serve our students, so this property and the building plans are critical to our future. 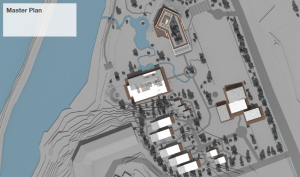 The Academic Village is a planned development to be built with state-of-the-art sustainable methods, and would provide housing for our residential graduate students, summer course participants, consortium classes, field trips for K-12 students, and visiting scientists (Fig. 3). 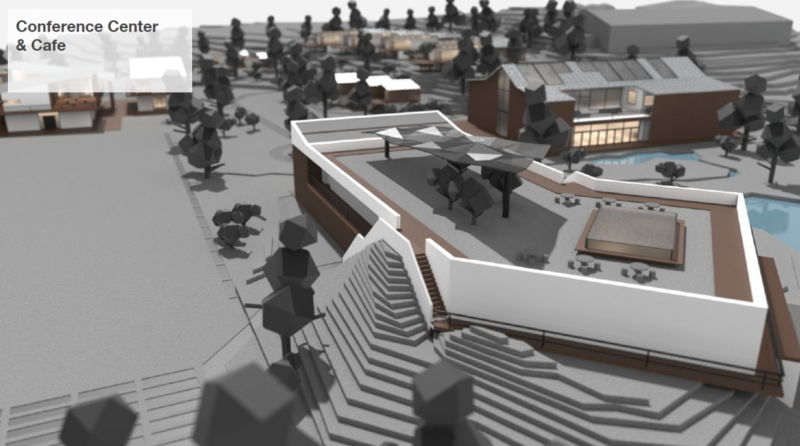 The conference center/research facility would provide space for larger classes than are possible at the Main Lab building, and would provide lab space for collaborating scientists and classes (Fig. 4). Our concept is to provide all of the activities listed above, greatly increase our capability of serving larger undergraduate courses, and maintain a sense of a marine science community using sustainable “green” building methods. Larger dorm-like dwellings and possibly Yurts for short-term housing. A research lab with running seawater, wet tables and tanks for holding live organisms for classes and researchers. Josh Nelson (faculty member in Industrial Design) and four of his students at SJSU helped develop a preliminary design of the Academic Village. MLML Faculty, staff, and students engaged in a number of meetings to provide concept designs and ideas for this space. After a number of iterations, the current plan unfolded. It incorporates the various buildings into a village concept with wandering paths connecting the buildings, various outdoor spaces (teaching, private discussions, and entertaining), and seawater and freshwater waterways (Fig. 3). The idea is to create a location that inspires learning, creativity, relaxation, and community. Figure 3. 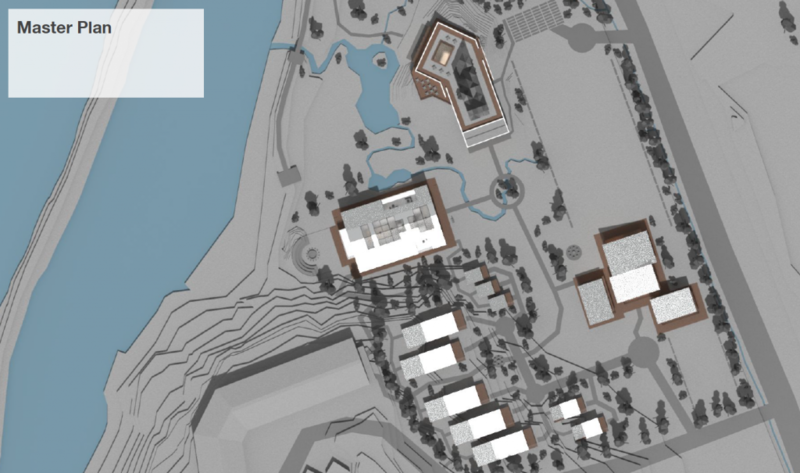 Site plan for the Academic Village with conference building in upper area, classrooms and lab space in the "barn" structure on far left, and short- and long-term housing in the lower part of the acreage. Figure 4. 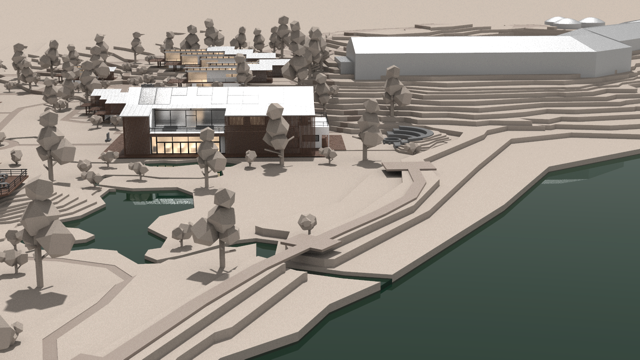 Image of the Conference Center in the foreground, the barn (classrooms, labs, offices) in the back right, and housing in the background from the flatlands (short-term) up onto the sloping hill (long-term). This property is critical for the expansion of the lab so that it can serve more undergraduates, more classes, and more researchers. It also would provide affordable housing options for our graduate students that struggle with rental rates that are some of the most expensive in the country. 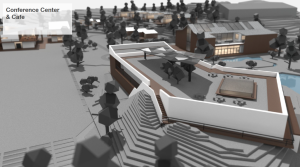 Here is a short animation that depicts the various aspects of the proposed Academic Village at MLML. Because State funding for such projects is extremely limited we will begin a major fund-raising effort in the near future. To learn more about how you can help support the Academic Village, our students, and our programs at MLML with cash, stocks, or an estate gift please contact Jim Harvey. Figure 5. Barn and waterway in the Academic Village to the left with the MLML main building in the upper right and the Salinas River in the foreground.